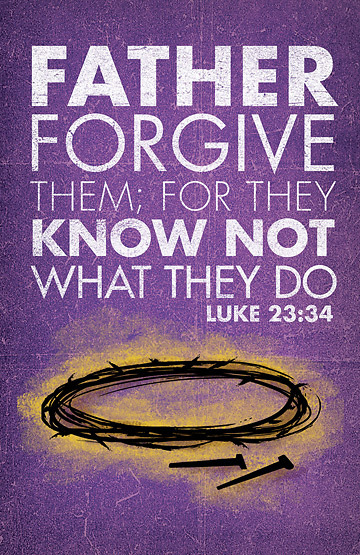 This banners blends contemporary style with the cherished message of Luke 23:24 – “Father forgive them for they know not what they do.” High resolution digital printing on matte-finish poplin fabric background features contemporary design in appealing and unique colors. An image of a crown of thorns and nails add to the majesty of this banner. It is 3’ x 5’ and has 3-inch pole hem in the top with T-pole cut out. This banner, along with the other banners in the series, helps you reflect on this time in the Christian year with one cohesive and eye-catching look. Remember your banner stand, which can be found in the Related Products Section below. Cokesbury has a large selection of banners, take a moment to look at them. Check out Worship Connection to see all the ways you can worship during this season of hope. In most instances, banner can be simply wiped clean, but is machine washable using cold water. Use warm iron on reverse side only. “Lent” is derived from the old Anglo-Saxon word “Lencten,” for spring. Lenten observances began very early, as both Irenaeus and Terrullian refer to it, but it was originally very brief, only gradually growing to forty days. At first, a fast of forty hours was observed, then a week. But by A.D. 325, the Council of Nicaea recognized forty days of Lent. These forty days included Sundays, but by the seventh century Lent was extended to forty days, excluding Sundays, and Ash Wednesday was established.